The eventual morning on Tuesday, September 2 was a thrilling time as we, the students in Mr. Pugh’s assembled outside on a hill. It was fun talking with most of the other classmates who I had been in previous grades with. That week one of our exercises in Math class was how we would determine patterns. There was one sheet that I was unable to complete. In class, we were marking that assignment and others. Luckily Ian was marking mine filled in the answers that I hadn’t completed. Prior to our class photo was taken, we were waiting in line, out of nowhere Ian had brought up the “Mr. Sparkle” episode of THE SIMPSONS. 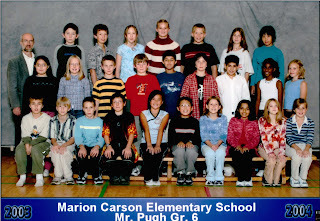 As I wanted to be next to Ian in our class photo I hunched my shoulders so I wouldn’t be in the front row with the tall students. It worked! That's lil' ol' me wearing a dark blue shirt in the middle row next to my bud, Ian. At the start of each class day, we would write in our journals. The previous day I went with my father to the library and I borrowed the book on comic books artists. I would read the entry on Carl Barks and I plagiarized it unaware I was doing that. Mr. Pugh’s comments on one of my entries, “You, sure know a lot about Carl Barks!” When we would assemble words for our spelling test, I would peruse through an Uncle Scrooge story to find words. One of my wishes that summer was to obtain a comic-book from the Dell or Gold-Key era. Despite the print quality being of a lower quality, I wanted to get a whiff of that oxidized paper. I wanted to know what it felt living in the era of the sweet sixties. When my mother came back from her visit, she gave me a Top Cat comic book. It was a bizarre product as the cover was from the Charlton first issue of Top Cat, yet the contents were from Gold Key issues #30 and #31 of the title. Initially, I was unreceptive to the comic book based on the cover, however, once I read the first story, “Physical Fit-Mess” I was hooked. 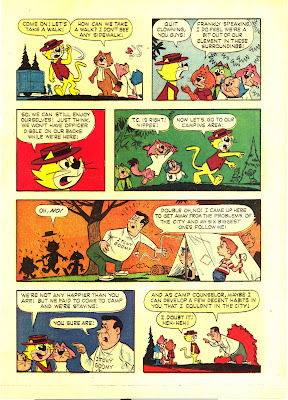 I was entertained by how Top Cat and his band of alley cats outsmarted Officer Dibble. Outside of hearing the theme of the show and seeing the snippet from a preview, I was unfamiliar with Top Cat. As odd as this sounds, I was wondering how the characters would sound in my head. The first panel with T.C. and his alley cat members Brain, and Benny The Ball set up the setting of the series. In the second tier I liked Top Cat's line. I applauded their creative method of walking to Elmwood, namely as one member carries the rest while he walks. I was in awe of how spectacular the artwork look. The characters looked on model. Eleven years later I discovered the man responsible was Phil DeLara, who drew many of the H-B properties in addition to Daffy Duck, Gyro Gearloose. I can imagine this must have been what it must have felt like for many of Carl Barks fans to recognize his work, but not know who he was. Another favorite story of mine "City Cats On Campout". Unbeknownst to me at the time what I found interesting about the story was how it drifted in the setting. The variation of a different locale provided many new gag opportunities of T.C. and his gang causing mayhem for of all people - Officer Dibble. I chuckled at how Top Cat's response to creating a fire with sticks and Benny The Ball's amusing witticism of extinguishing a fire. Years after I read this story I laughed as much then as I did now. A good fraction of my lexicon comes from comic books. I learned the word - exorbitant from the story "Last Of The Pirates". It was later the following week, that after school, Ian asked me if I would like to come to his house. My mom had already arrived to pick me up, I asked her if she was all right with me going to Ian’s house. She told me that she was fine with the idea and that my dad on his way back from work would pick me up. I was envious of my classmates who resided in Varsity would hobnob as they walked on the way back from school. I imagined how fun it would be, to be a part of a clique. That day Ian and I stopped by the park to play with the other students. One faithful weekend, Ian came over to finish our homework. When we were almost done, we decided to draw pictures of Donald. 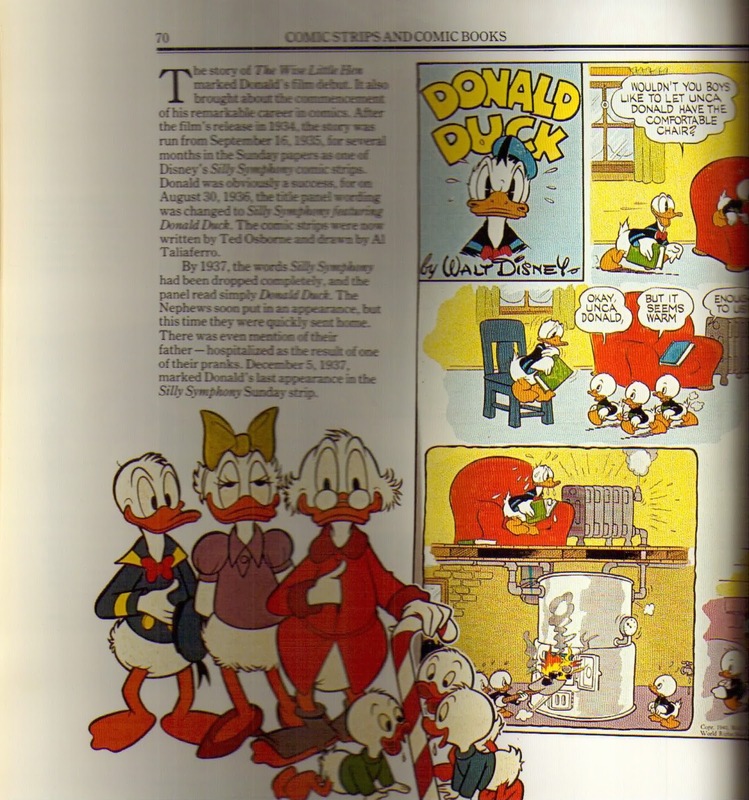 I checked out “Donald Duck: 50 Years of Happy Frustration” from the library again, we looked at the page that showed a collage of comic book covers. We drew pictures of Daisy Duck and Uncle Scrooge based on the cover of “Donald Duck” #95. On the way to “Pizza Hut”, he asked my dad, if he read Scrooge comics during his childhood. While we were there, I was opening a packet of sauce only for it to ooze onto one of the patron’s hair. I was quite embarrassed at that incident but he was laughing non-stop. This was the very page that we looked at. Ian's drawing of Uncle Scrooge was based on Tony Strobl's rendition as seen here. When I went to school on Monday, Ian presented me with an item wrapped with blue tissue paper. He told me not to unwrap it until I am at home because he wanted to keep it a surprise. Throughout the day I was very curious about what the item was. Once I came back from school, I eagerly removed the tissue paper to open Ian’s sketch of Uncle Scrooge. Underneath the drawing was issue #319 of “Uncle Scrooge”. Oh, boy was I ever excited to read it! One long weekend, I went with Spencer and Ian to Westside Recreation Centre. (It was home to where Ian and I first spent time together.) We had a blast sliding down the water slides. Once we finished we dined at Boston Pizza. After my father dropped of Spencer at his house, we went to Ian's house to drop him off, however, nobody wasn't there. So we went to Rogers Video in Varsity rented "The Simpsons: Season 2". When we arrived home Ian and I binged watched THE SIMPSONS. What had detracted me from the early episodes were emotional. I felt a pang upon seeing Bart bawling after not receiving his desired grade ("Bart Gets an F"). Underneath their yellow flesh, we see aspects of our self that we can identify. 'Over time I miss the heart of the early episodes of THE SIMPSONS. My favorite episode that was a complete shift in tone was "Three Men and a Comic Book". As a geek who was in love with comic-books, I related to the feeling of one day owning a vintage comic-book. It was two weeks before Halloween I was deciding who to dress up as. I decided on dressing up as Uncle Scrooge. Using the pose of him from the cover of US#45 I drew it. When it was Halloween we whooped it up at school with a party. I was proud to show my mask. As the offerings in Varsity were substantially better than Hawkwood that was where I trick-or-treated. Spencer invited me to his house for a sleepover that Halloween. Originally the plan was for Ian to join us however, he had a cold and didn't want to pass his cold onto us. At Spencer’s house, Ian, Scott, Vickie, and myself assembled there. As it was snowed the night prior we went from house to in the bone-chilling cold. I remember towards the end how cold I was. We warmed up internally by watching "Treehouse Of Horror XII" an episode of THE SIMPSONS. 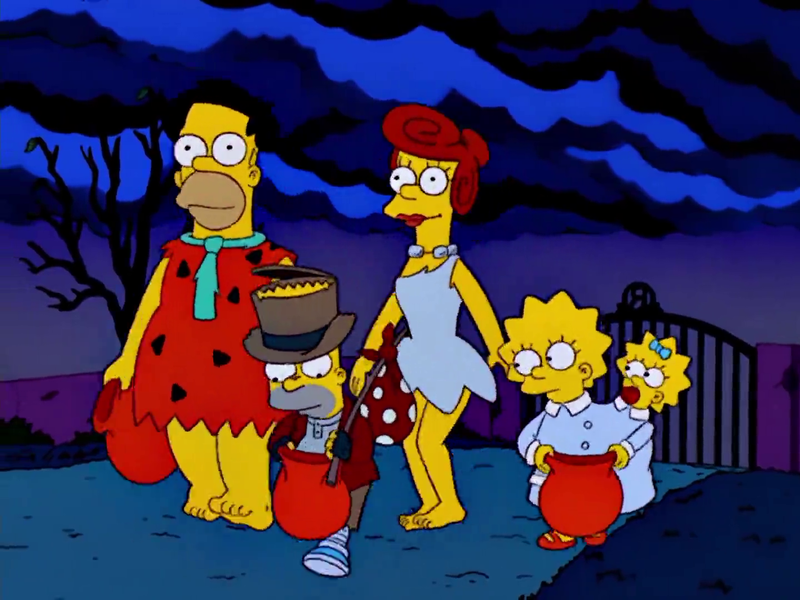 I had never seen the cold open for this episode and I was pleasantly surprised seeing Homer and Marge dressed as Fred and Wilma Flintstone respectively. Once school closed for the winter break, Ian and me, had one of our traditional sleepovers. We snacked on stuffed crust cheese pizza and chicken wings on the side from Pizza Hut, while we watched, “THE PARTY” (1965). The late Peter Sellers employed an impeccable Indian accent for the main character Hrundi V. Bakshi. Peter Sellers (Hrundi V. Bakshi), poured a lot of sincerity in this role as the outsider trying to fit with the guests of the gathering. He has no idea of the social norms. 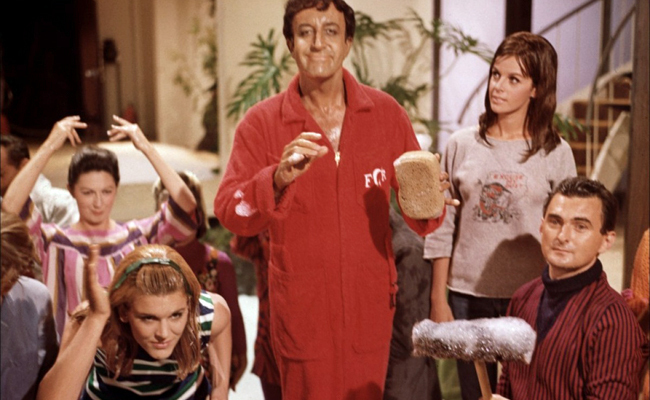 Peter Sellers slapstick gags were in the traditional slapstick stylings of Buster Keaton and Laurel and Hardy. Henry Mancini’s score added to the swinging sixties with the sitar strumming in the background. The ending of the film left me with a warm feeling all over. When we came back from winter break, we regularly quoted Hrundi’s lines: “Oh! Bang! Howdy, Partner!” and “Birdie Num Num”. It was always fun to exchange lines back and forth from the film. 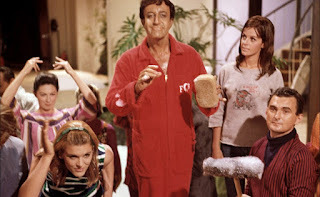 Hrundi V. Bakshi (Peter Sellers) in the center; Claudine Longet (Michelle Monet), right in THE PARTY. One of the downfalls during this break was that I had a bad case of the cold. I went with my mother to the newly opened Crowfoot branch of the Calgary Public Library. I was disappointed how that I didn’t find any “Donald Duck-centric” books. When we came back my head felt heavy, although I felt a bit better when I viewed the Rankin-Bass special, “Santa Claus Is Comin’ To Town”. I was fascinated by the stop motion animation. The voices were terrific, especially that of Paul Frees as Burgermeister Meisterburger. The following day I went with my mother to Comic Kazi to pick up the recent issue of Uncle Scrooge along with “Walt Disney’s Comics and Stories” #635. A fine issue that provided lots of comforts, along with the hot soup and orange juice. 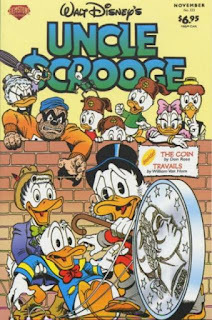 Don Rosa’s opening story, “The Coin”, was interesting, it revolved around the titular coin from Scrooge’s money bin to all the hands of Duckburg. Throughout the tale, Donald endured a lot of pain. 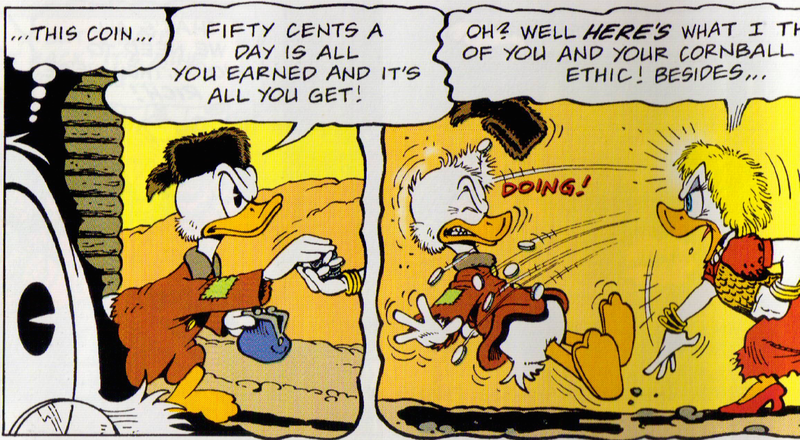 Here are some instances: Donald while flipping the dime that Uncle Scrooge gave him for a newspaper he bonked himself on the head. As he attempted to retrieve the dime, a tire ran over his foot. After the mixer inadvertently acted up causing it to overflow Daisy hit Donald in the back of the head. Lastly, the dime fell from a building ledge onto Donald’s head causing him to fall down. I noticed how Donald in Don Rosa’s stories he tended to suffer the abuse from others. 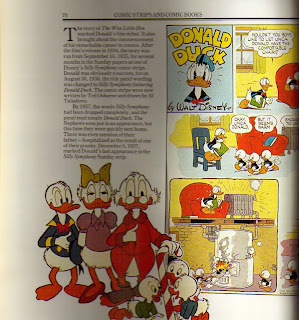 I found his renderings when a character, mostly Donald, is victim to violence it looks a bit too realistic. I appreciated despite the pain he withstood, he was rewarded by Scrooge reinstating his position. It was cute seeing him and Daisy hold hands as they left the money bin. Overall a fun story where all major players in Duckburg having a bit part. The ending of the story Don Rosa showcased a flashback sequence from Carl Barks’ “Back To The Klondike” (1952). As I was unfamiliar with that tale seeing that panel (see below) was my earliest glimpse. An example of Don Rosa's excellent expressions. I experienced the rage as Goldie hurled the coins at Scrooge and the impact he felt of the cold coins.